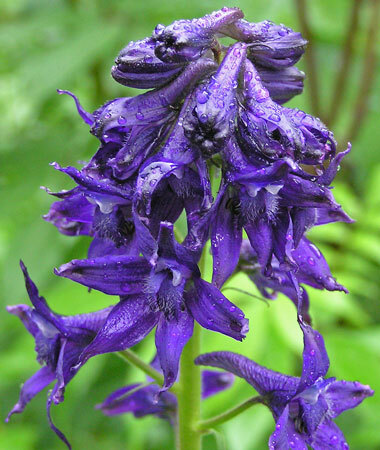 Delphinium is from the Latin "delphinus", "Dolphin", for the resemblance of the flower buds to a pod of Dolphins leaping. Subalpine, alpine. Meadows, woodlands. Summer. Above: Along the Stony Pass Road, July 27, 2017 and Kilpacker Trail, August 3, 2009. Left: Navajo Lake Trail, July 11, 2005. 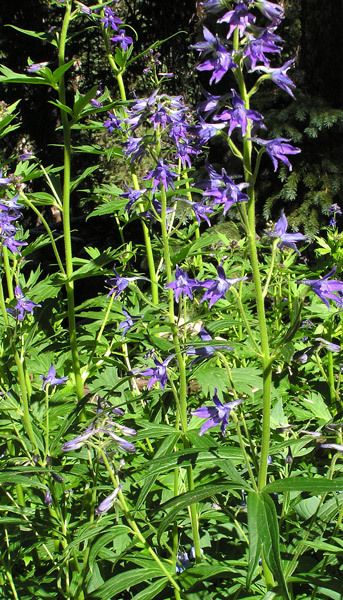 Delphinium barbeyi is a favorite for many hikers; it is certainly one of my favorites. 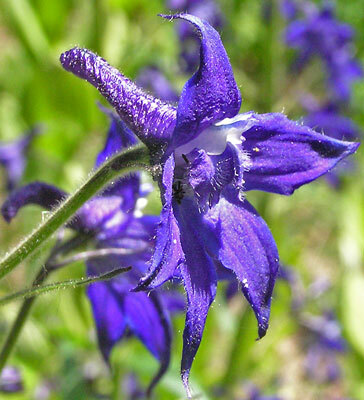 Delphinium flowers range from an iridescent inky-blue to deep purple, the plant's four to seven foot flower stalks are stately and eye-catching, and the plant is abundant and long-flowering. 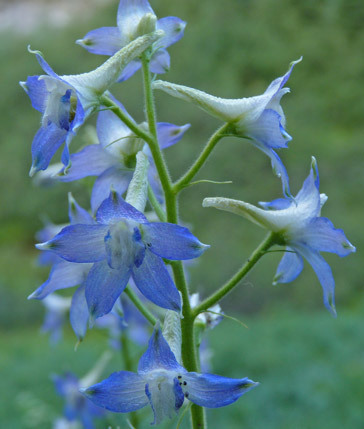 Click to see a comparison of the leaves of Delphinium barbeyi and several other species. 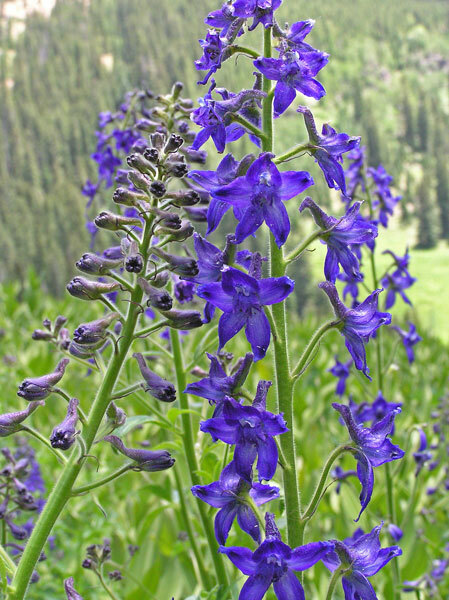 Along with the massive white flowering Cow Parsnip and lacy white Loveroot, Delphinium dominates moist, subalpine Aspen woods in July and August when the three put on one of the finest mountain wildflower displays. 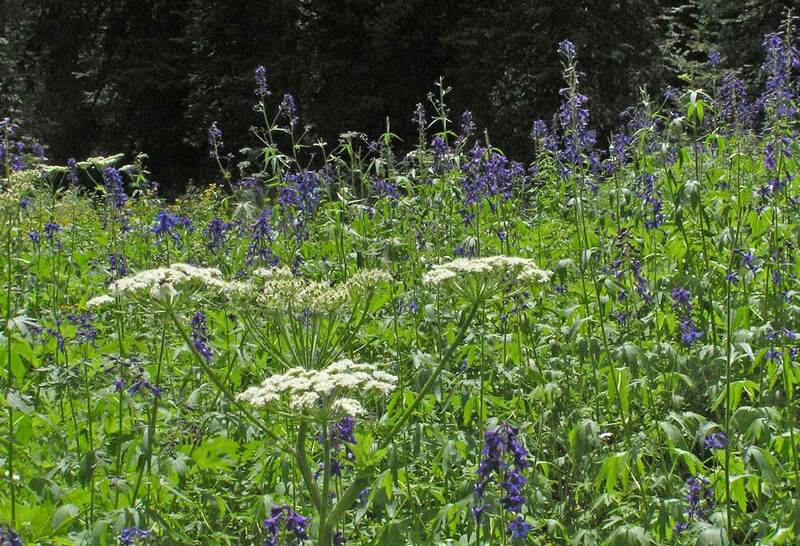 Tall flower stalks of blue and white seem to float above acres of green, dense, moist, redolent summer foliage. Stretching high above are brilliant white Aspen trunks capped with quaking green leaves and radiant shafts of Colorado violet-blue sky. This species was first collected for science by Hall and Harbour (associates of Charles Parry for one glorious collecting season in 1862). 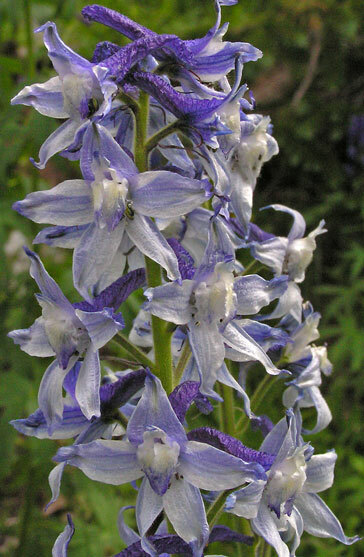 The plant was at first named Delphinium scopulorum variety subalpinum by Asa Gray in 1887. In 1893 Ernest Huth gave the plant its presently accepted name to honor William Barbey, late 19th century Swiss philanthropist and botanist. Navajo Lake Trail, July 11, 2005. The right pointing arrows are directed to the five purple sepals, the top one having a long spur sticking out to the 11 o'clock position. 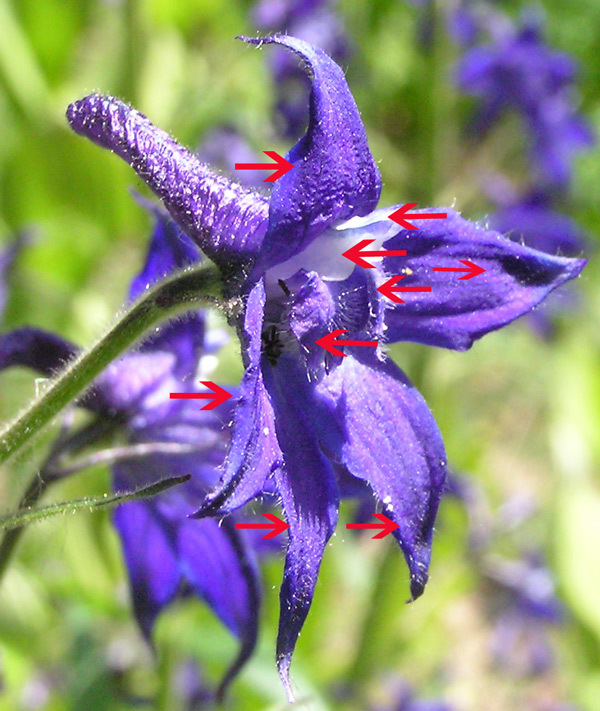 The left pointing arrows are directed to the four petals, two upper white ones and two hairy lower purple ones. The white petals are especially interesting as they too are spurred and fit into the spur of the upper sepal. Navajo Lake Trail, July 11, 2006. 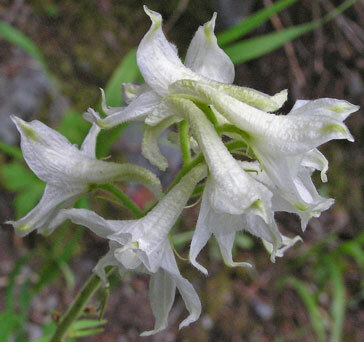 White flowering Delphinium barbeyi is rarely seen -- and rarely forgotten. Shoulder of Helmet Peak, August 19, 2005 and Bridal Veil Falls Trail, August 26, 2012. 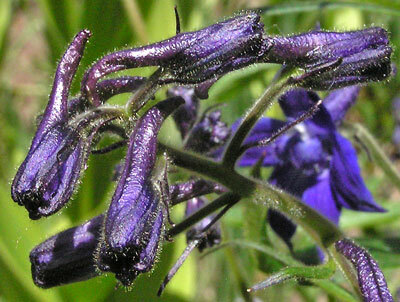 For years I believed the flowers at left were examples of variations in the color of Delphinium barbeyi. 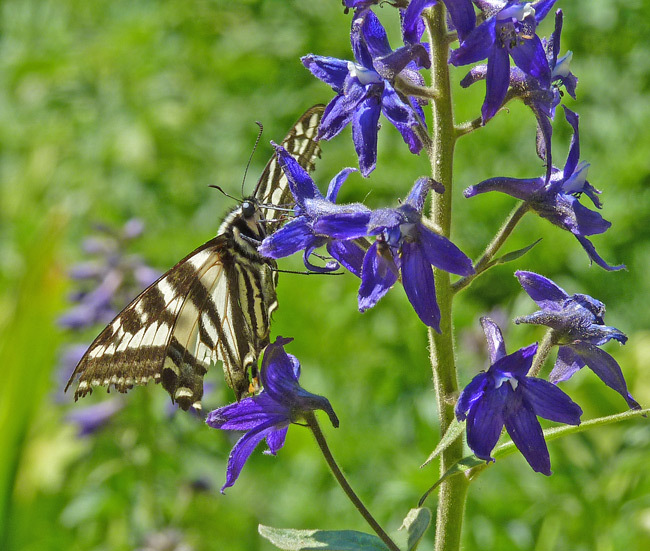 But in 2015 I came across very robust Delphinium plants with similar flower colors and realized that they belong to a different species, Delphinium robustum. Click to see this species. Bridal Veil Falls Trail, July 26, 2012. The glow at the side of the stems (visible in the third photo at left and especially visible in the photo immediately below) is due to the presence of a myriad of fine, straight hairs. 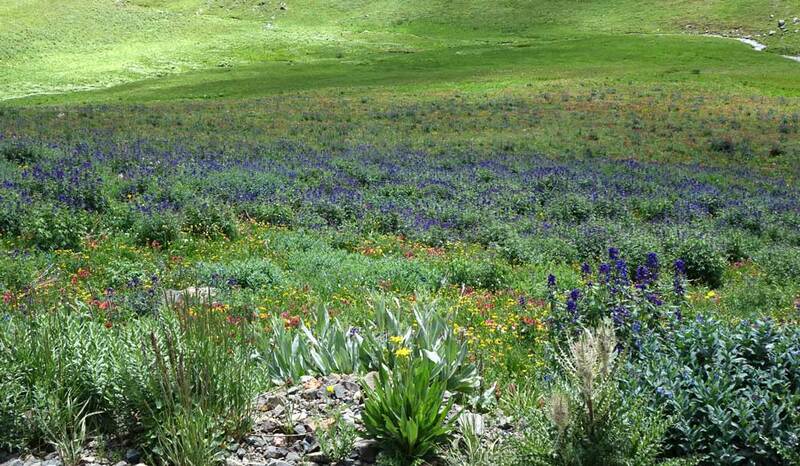 Pass Creek Trail, June 22, 2012.